The Nanohana Law Office is a judicial scrivener cooperative offering legal support which meets several needs. We can act as your agent in the application process for the rights of real estate such as land and buildings, for example, the registration of the transfer of ownership when you buy land or a house. We can act as your agent in the process of application for the registration, formation, change of officers, capital increase, merger, or split of businesses which are stock companies or limited companies, for example, the registration for incorporation of a company when you start a business. We can act as your agent in making legal documents for submission at each of these kinds of court: summary court, district court, and family court, for example, making an application for conciliation and judgment or for civil rehabilitation. 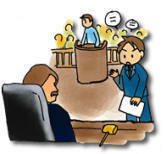 In summary court we can bring suit and oral argument for you as your agent. We can also negotiate with opponents out of court and, if possible, reach an amicable settlement (provided that the civil case concerns a legal sum of under \1,400,000). For example, the case might happen that a lessee does not pay the rent, and the owner of the house does not return the security deposit. In that case we as judicial scrivener can negotiate with the opponent as your agent and in case of a break down in negotiation, we can bring civil action. We as judicial scrivener can provide legal support concerning judicial decisions for persons of advanced age or who have a developmental disability, for example, the application for a court-appointed guardian of adult, or optionally, we can be contracted by you as a guardian of adult.